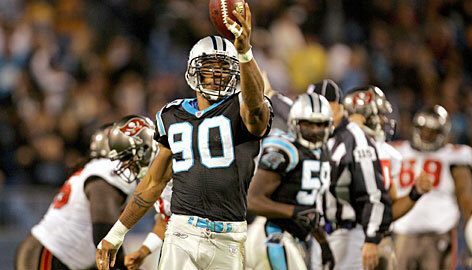 There has not been much movement on the Julius Peppers front lately for the Panthers, and now general manager Marty Hurney says he thinks that the teams franchise player will be back in 2009. This despite Peppers wanting to move elsewhere. Hurney says he thinks that if a deal can’t be worked out to move Peppers, he thinks that the four-time Pro Bowler will be back with the club in 2009. The Panthers put the franchise tag on Peppers before free agency started, but he has not signed the one-year tender for $16.7 million, however, and has said he won’t sign a long-term deal with Carolina. Right now another team could sign Peppers only by giving the Panthers two first-round draft picks, or the Panthers could trade him away, which would seem a lot more likely.